If style and dressing sharp is an instinct that you possess and you always like to be seen in public well put together and matching in your casual best, a leisure pants set by Montique is exactly the type of outfit that you have to be seen in. Montique always seems to come out with sharp styles when it comes to their casual looking pants sets and this wine color shirt and pants set is no exception. 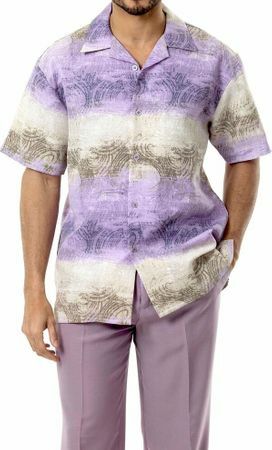 This lavender color casual pants set features a unique looking geometric pattern on the shirt. It has an open style collar that makes it very comfortable to wear and matching solid lavender pleated pants.